“Celebrating 30 Years of Black History, Culture and Art” is the central theme of the Savannah Black Heritage Festival scheduled for February 1-22, 2019. Cultural education and exposure to the performing and visual arts are offered for all ages and interests throughout the celebration. Special programs and activities during this festival will serve as a tribute to the late Westley W. Law, the founder and former organizer of the Savannah Black Heritage Festival. The month-long celebration will kick-off with two days of activities observing National Freedom Day. The observance was initiated by Major Richard R. Wright, former slave and first president of Savannah State University, to commemorate President Abraham Lincoln’s signing of the 13th Amendment outlawing slavery. Following 10 a.m. memorial wreath-laying ceremonies at Rousakis Plaza, Franklin Square and Emmet Park, on February 2, all are invited to celebrate W.W. Law with an opening ceremony, youth leadership session and a festival poster art exhibition featuring the beginning at 11 a.m., Ralph Mark Gilbert Civil Rights Museum, 460 Martin Luther King, Jr. Blvd. Youth groups should call 912-232-2626 for information. The W. W. Law Lecture will feature Dr. Benjamin F. Chavis, president and CEO of National Newspaper Publishers Association and CEO of the Hip-Hop Summit Action Network, February 4, 6:30 p.m., St. Philip AME Church, 613 Martin Luther King, Jr. Blvd. 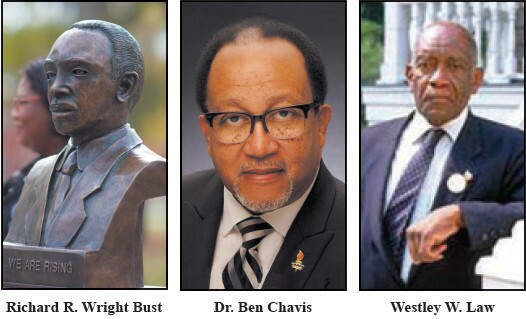 The Telfair Museums will host a panel discussion highlighting W. W. Law’s impact in Savannah through Civil Rights, historic preservation and the arts, February 13, 6:30 p.m., Jepson Center, 207 W. York St.
Join the opening and reception for the 18 annual New Beginning Art Exhibit, sponsored by the Savannah (GA) Chapter of The Links, Inc., February 7, 6:30 p.m., at the new Savannah Cultural Arts Center, Montgomery and Oglethorpe. More art will be unveiled February 10, 3 p.m. Local artists Richard Law, Karla-Sue Marriott, and Tyriq Maxwell will present “Expressing 30 Years of Diversity, Black Heritage, and Culture through Art” at Raw Ilmage Barbershop and Studio, 113 East Montgomery Cross Rd. They will follow-up with an artist talk February 17, 3 p.m.
View the Sankofa Traveling African-American Museum exhibition at the Mark Gilbert Civil Rights Museum, 460 Martin Luther King, Jr. Blvd., February 16 and 17. Join the historic marker dedication February 22, 10:30 a.m., Crusader Center, 81 Coffee Bluff Villa Rd. The marker will address the legacy of African Americans who settled along the waterways in the area. The Savannah Black Heritage Festival is presented by Savannah State University and the City of Savannah. Investment for the festival is provided by the City of Savannah. A majority of festival performances and activities are free and open to the public. A $5, all-day admission bracelet for Grand Festival Day, February 9 (Ages 18 years & older) will be required. Free admission with SSU student ID. Events, dates, times, performers and locations are subject to change. Visit savannahblackheritagefestival.com or call 912-358-4309 for updates.